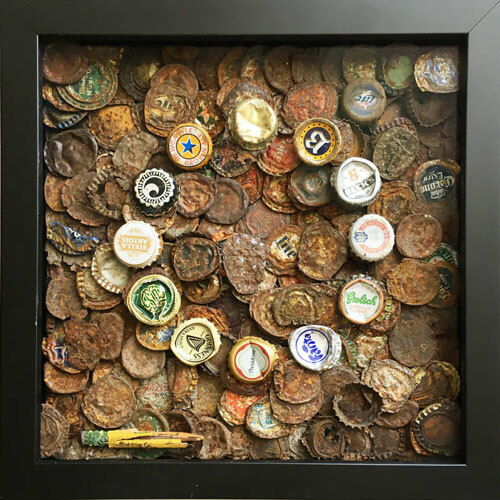 It was the steel bottle caps that were my facination and became the first object I took the time to actively collect. At first I didn't know what I was going to do with them, only that I knew I loved the small dots of rusted / oxidized metal. My collection grew to a 1,000 or so, all from the local streets and alleyways. I got to know the neighborhood and what restaurants had a habit of letting the caps litter the area out their back door, near the dumpster. A few convenience stores and bars also joined this special club. "Thinking Caps" highlights a backdrop of very rusted, degraded, flattened bottlecaps, some very thin and broken. The 12 caps that make up the bright circle mark time, showing what these objects look like around the time they are first discarded. If left in the street, and ignored long enough, they too would lose their color and shine... slowly being reclaimed by Mother Nature. Original is available and FOB Broward County, Florida. Shipping is extra and the artist will be happy to give you a quote. $565 for the original framed in black, the mixed media is under Ultra-glass (nearly invisible -- and yes, I've seen the curious actually touch the glass, leaving their fingerprint). The piece will be on exhibit at Artserve, 1350 E Sunrise Blvd through the end of July, 2018, as part of the RedEye: Beyond exhibit. Size: 11.25" x 11.25" x 2.25".